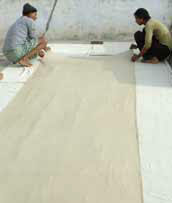 Phad Painters usually prefer the hand–woven and hand–spun (Khadi or Reja) coarse cotton cloth which is believed to be stronger. It is processed to make it good for the purpose. 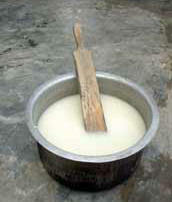 The artist prepares a mixture of wheat/rice flour and boils it with water till it turns in a thick fine paste. This process is called "Kalaph Banana". 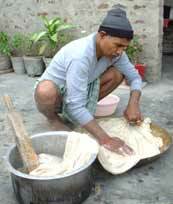 He then applies the paste of boiled wheat/rice flour and gum on the cloth. It is called "Kalaph lagana". The cloth is stretched and dried well in hard sunlight. This is called "Sukhana". and then rubbed with a stone device (Mohra) to make it smooth and shining. This is called "Ghotana". The cloth is now ready and works as well as canvas. The artist prepares his paints from gum, powdered earthen colors, water and indigo. They keep a grinding stone on which the colors are ground with gum and water. This process is called "Rang Banana". Earthen colors are used to give the tempera effect. Indigo, a color obtained from a plant, is still used for blue. They use sea-shells to keep color. The painting begins on an auspicious day with the ritual offering of a coconut to Sarasvati (the Hindu goddess of learning and fine arts). 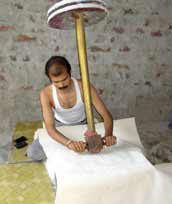 The first stroke of brush is always made by a virgin girl belonging either to the painter’s family or to a higher caste. The painter first of all divides the entire scroll into a number of sections and sub-sections, then he prepares rough sketch of the whole painting in light yellow color. This is called "Kachi likhai Karna". As the rough sketch is ready, the artist starts using colors in layer pattern from lighter to darker value, Orange for limbs or torso of figures, Yellow for ornaments & general clothing & designs, Green for trees & vegetation, Brown for architectural structures, Red for Royal clothing & flags and blue for water and curtains. This is called "Rang Lagana". The subtle black lines give the final touch. The forceful linear expressions become lively after "Shyahi kadhana ( Application of Black Color) is put on the phad. On an auspicious day the painter completes the phad. 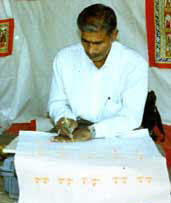 The artist signs in the central part of the scroll where the largest figure of Devnarayan/ or Pabuji is painted. He writes his name, as also the names of the Bhopa and the patrons together with their addresses and the date of signing.